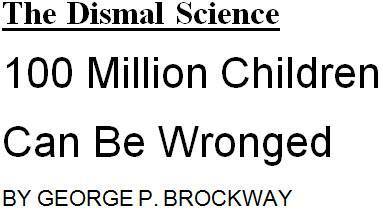 ONE HUNDRED MILLION children are expected to die unnecessarily in the brave new decade that lies before us. The estimate is, I fear, reliable, because children are dying–unnecessarily–at that rate now: 10 million a year, 27,000 a day, 1,200 an hour, 20-30 in the time it has taken you to read this far. They are dying that fast; and while many dedicated people are desperately doing what they can about it, we as a civilized and sophisticated nation are doing nothing substantial to help, nor are we likely to. In fact, we are more likely to hinder than to help. You and I assuredly could spend our money more wisely and more responsibly, but we are not directly to blame for these unnecessary deaths. Nor will our attending occasional charity rock concerts or across the continent do much to end the plague. No. Those 100 million children are doomed because our bankers “want to succeed, not just survive,“ and because we are too timid or too lazy or too ill-informed to call the bankers to account. Thirty years ago the outstanding indebtedness of the Third World was $7.6 billion. It is now approaching (if it has not already passed as I write) 200 times that, or $1.5 trillion. It would certainly appear that the First World (including the World Bank, the International Monetary Fund, and private and government banks) has been pretty generous. No doubt there is some generosity lurking in this huge amount of money, but most of the sum comes from the great recycling bankers like to boast about. The whole thing started with OPEC, which made the oil-producing countries very cash-rich very quickly. The banks saved them from the worry of spending this money in the nations where the sold the oil. They all–foreign banks as well as American–rushed in and offered the Arabs and their associates high interest rates for their deposits. Having attracted a share of OPEC’s money, the banks now had to complete the cycle and find someone to lend it to. The Third World was ideal for the purpose. The countries were many and small; the needs were great; the governments were weak; and many of the rulers were rapacious, almost as rapacious as the bankers. In their fierce competition with each other the bank’s loan officers became salesmen. Often with the advice of experts from the World Bank, useless projects were financed–like the longest power transmission line in the world, with nothing to speak of at either end, or a billion-dollar state-of-the-art steel mill that was too sophisticated to handle the low-grade ore it was supposedly built to process. Skyscrapers were put up next to mud huts. Stately mansions were built for dictators. And a great many dollars went straight into numbered accounts in Switzerland. The bankers didn’t care, because the interest rates were high, and former Citicorp CEO Walter Wriston had convinced them that countries don’t go bankrupt. The entire gaudy tale is told in Richard W. Lombardi’s Debt Trap: Rethinking the Logic of Development. When Lombardi’s book appeared in 1985, the Third World debt had not quite reached a trillion dollars. Since it is now a trillion and a half, it would seem that the First World has been sending the Third $100 billion a year for the past five years. Well, not exactly. In fact, hardly at all. For most of the $500 billion never went to the Third World. It never left the First World, because it never really existed. The bulk of that lovely nonexistent money is usurious interest that the Third World couldn’t pay, and that the banks, after profound consideration and solemn negotiation, have simply added to the principal. So things get steadily worse. There is no lack of suggested solutions. When James A. Baker III was Secretary of the Treasury, he had the Baker Plan, which the press pronounced brilliant–and precisely nothing came of it. Nicholas Brady, his successor, brought forth the Brady Plan about a year ago, and the papers were filled with praise of it for a while, especially after Mexico and the banks accepted it, or said they did. The actual results haven’t been so newsworthy, but Teotihuacan wasn’t built in a day. IN THE MEANTIME the International Monetary Fund and the World Bank haven’t been idle. They publish their ideas in Finance & Development, a quarterly magazine written in the sort of mush that might be produced by crossing a banker’s banquet speech with a TV talk-show on economics. The message is that the debtor countries have to reform. This is probably true, yet the required reforms are curious. They seem to have been cribbed from the Republican campaign platform, with perhaps a thought or two from Margaret Thatcher. A few paragraphs further we learn that the banking system suffers from “insufficient supervision, and excessive administrative interference.” This would seem a dilemma unless you understand that the IMF should supervise, while the locals mind their manners. A little later we are told that “a more flexible, market-oriented interest rate policy will contribute to enhancing financial intermediation, improving resource mobilization, and increasing the efficiency of credit allocation.” Ex-Federal Reserve Chairman Paul A. Volcker couldn’t have put it better as he transformed us from the world’s largest creditor to the world’s largest debtor. As a final example, consider this: “The objective will be to select revenue measures that enhance the elasticity of the tax system. The former will help improve incentives [and so on and on].” Since the gap between the rich and the poor is even greater in sub-Saharan Africa than in the United States, and the African rich are notoriously casual about paying their taxes anyhow, I leave it to you to imagine how “incentives” can be improved. The IMF insists on other “reforms”: currency devaluation to bring local money closer to overvalued dollars; privatization of the few existing public services; schemes to encourage foreign speculators by making it easy for them to pull out if the going gets rough; abolition of import quotas and most tariffs. (The United States is threatening sanctions against Nigeria for trying to conserve foreign exchange by banning the importation of wheat.) The IMF demands practically guarantee that the debts cannot be paid, but it is gravely averred that their purpose is to improve the prospects of payment. Will not this forgiveness save at least the children of the 12 nations? Sadly, there is no reason to expect it to, for there are strings attached to our generosity. Our cancellations will take place over the next two years, and only if the lucky 12 are good little nations and do what the IMF says. True to its primary mission of helping countries correct balance of payment deficits, the IMF will see to it that the First World banks (who have not canceled their loans) have first call on the foreign exchange that becomes available, and children will die for lack of medicine. LIKE THE Ancient Mariner, we war veterans have a glittering eye. (I have seen mine reflected, dully, in my grandchildren’s eyes as they prepare to listen dutifully.) We could tell you a tale or two-and we will. Indeed, I will, here and now, tell you war story that has a lesson for us today and for tomorrow too. Perhaps you were there. After all these years I may be off a bit on some of the details. If so, you can correct me. But I’m sure that I have my oral straight. It was, as I remember it, in the fall of ’37. The battlefield was not on the banks of the Ebro but in Herald Square. Macy’s let loose a barrage advertising a special on the Modern Library: three volumes for a dollar. Skirmishing had been going on for months or maybe years but the price had rarely fallen below wholesale, somewhere around 50¢ (the list was 95¢). The big battles in the last half of ’36 and the first of ’37 were fought over Gone with the Wind, which, in spite of its $3.00 list price and an ordinary wholesale price of $1.80, sold as low as 49¢ in auto supply stores. It was the big loss leader: possible profits on Margaret Mitchell’s work were expendable as-Ion- as it lured in people to buy bigger-ticket items. By the fall of ’37, practically everybody who wanted a copy of Gone with the Wind-and many who didn’t-had one. So Macy’s tried to effect a breakthrough with the Modern Library. The book section, then on the main floor, was mobbed. We rushed in from every point of the compass as soon as the doors opened. I still have my three books: The Education of Henry Adams, The Theory of the Leisure Class, and D.H. Lawrence’s The Rainbow (a novel, I’m ashamed to confess, that I’ve never been able to finish). Did Macy’s tell Gimbel’s? No, but Gimbel’s was not caught napping. Its comparison shoppers were in the front line, rushing the news from 34th Street to 32nd Street as fast as it occurred. And of course, Macy’s spies were doing the same in Gimbel’s. I was a well brought up young man; so after I had elbowed my way to the table and grabbed my three books, I waited patiently for a clerk. My good manners were rewarded. Twice, as I stood there, an assistant buyer rushed in (we smartly made way for her) and lowered the price-first to 31¢, then to 28¢, the price by the time I was waited on. Maybe I’d have done better at Gimbel’s. I don’t know. Anyway, it was a good war. Even the most flaky Harvard philosopher would call it a just war. But it had repercussions. Booksellers for miles around were hurt, or thought they were, and screamed. Macy’s moved quickly. They ordered in, on top of their usual heavy inventory, an extra $50,000 worth of the Modern Library. That was a lot of money in 1937. Random was delighted. But when the publisher started talking about price maintenance, Macy’s whispered that it would have to return all those books for cash. 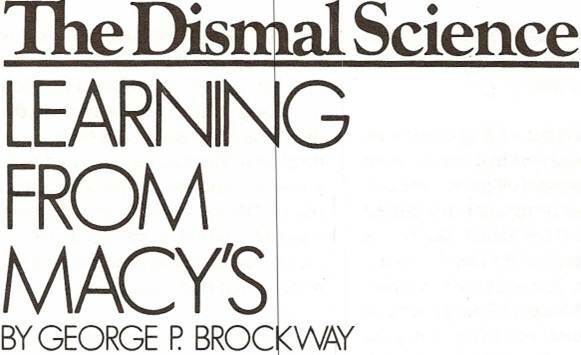 Random decided to bear those ills it knew, and continued to do so for another four or five years, until wartime shortages allowed it to call Macy’ s bluff and declare that it would take back any books Macy’s was ready to send. End of war story. The moral is this: If you maintain a large inventory, you can force your suppliers to play the game according to your rules. And where can we put that lesson to good use? Ina word: oil. Oil is certainly the second most screwed-up topic in political economy. I’m not sure what is first. Probably the deficit, or maybe the defense budget. No matter; they’re all related. President Eisenhower, who certainly did not regard defense frivolously, imposed a partial embargo on imported oil. Ike said (if you don’t believe me, you could look it up) this was a defense measure. Its expected and intended and actual results were (l) to reduce the importation of foreign oil, (2) to let domestic producers raise their prices, and (3) to encourage domestic producers ( a.k.a. wildcatters) to explore for new oil fields and exploit existing fields more thoroughly, Now, you, being a sober citizen, will wonder how all this made America stronger, and I will have to say that it had the diametrically opposite effect, for it caused us to use up our oil reserves faster than we might have otherwise. To be sure, the higher price of oil may have persuaded some people to conserve a bit; but the principal consequence was a draw-down of our reserves. The crazy thing is, people are clamoring for us to do the same thing again. This time the alleged purpose isn’t national defense but deficit reduction. Of course, if your real aim was to reduce the deficit, you would put an extra excise tax on all oil. No one, however proposes this, because it would annoy a number of politically active oilmen. Similarly, if you really wanted to make America stronger, you would import every ounce of foreign oil you could, now that the price is down. You would move, with more than deliberate speed, to fill up those salt mines (or whatever they are) where we started, back in the discredited days of Jimmy Carter, to accumulate a ready oil reserve. Before the oil glut, OPEC warned us that if we tried to fill those mines in order to reduce our dependence on them, they’d consider it unfriendly behavior and would respond by pushing up the price of oil, or maybe slapping a new embargo on us. Today, though, with pretty bad business and pretty good conservation world- wide, OPEC has so much oil it doesn’t know what to do. In addition, we have banks failing all over the West, and the growth of Houston, especially, is being corrected. So far, the only thing we have been able to think of is a trip for Vice-president Bush to explain to the Saudis that the people he represents hope that prices won’t fall too low. ADMITTEDLY, filling those mines would cost real money, even at present oil prices, and everyone has been programm-rudmanned to worry about the deficit. But here is where the moral of the Herald Square war comes in. Just as Macy’s excessive inventory of Modern Library books inhibited Random House from fixing the price at 95¢, so if we had all our depleted mines (and all our storage tanks) brimming with oil, it would be difficult, if not impossible, for OPEC ever to spring another embargo on us. Those full reserves would be a new declaration of independence for us. They’d make a quicker and more effective (and probably cheaper) contribution to national defense than Star Wars or nerve gas or re-commissioning obsolete battleships. What’s more, buying that oil would be an investment in something useful for civilian as well as military life. At the minimum, it would be a guarantee that we would not have lines at the gas pumps until oil was really running out. Charging such investments to the current budget is nonsensical accounting (but that’s another story). Filling our reserve capacity would also give us opportunities for a creative and hard-nosed foreign policy. Consider how the reduction of Arabian pressure on us would strengthen our position in the Middle East. And consider how we might distribute the orders for the oil: Naturally, we’d buy most from friendly countries that are heavily burdened with debt (much of it owed to us). Thus we could help, first of all, Mexico, which is on the brink of lMF-sponsored chaos. Then we could think of Venezuela, one of the struggling South American democracies, and of Nigeria, one of the struggling African democracies (at least in ideals). In the Middle East we could favor countries willing to put a bit of pressure on Syria. The possibilities are very great. Prudent friendliness on our part could earn us friendly prudence on the part of many important nations. So why don’t we do it? You know why. Even if we weren’t hung up on the deficit issue, even if the Administration and Congress could be gotten to see the light, the program would be stopped dead by influential senators and congressmen who are obligated to, or in fear of, 50-odd men who’ve made a killing in oil. You know these people would stop it, just as they’re now stopping tax reforms that might treat them like everyone else. These 50-odd men are not the Seven Sisters of Big Oil. Exxon and the rest usually support what they do, and their support rivals the clout of any other industry’s lobby. But the initiative and most of the money comes from the independents. What makes these few men so powerful? They are wealthy-really and truly wealthy-and they don’t give a damn about anything except having their own way. Every one of them is capable of signing checks for hundreds of thousands without worrying about the bank balance. Every one of them can make maximum contributions to political action committees as fast as the committees are invented. If you want a rundown on who they are and how they work, I refer you to The New Politics of Inequality by Thomas B. Edsall (one of the last books I edited, and a good one). We’re not talking about merely Texas and Oklahoma. There are appreciable amounts of oil in 10 or more states, some of them very populous. That gives the oil lobby a bloc of, say, 20 senators and 50-60 congressmen it doesn’t have to worry about. Moreover, many of these legislators have accumulated seniority and the committee chairmanships that go with it. In spite of all this, maybe the current economic difficulties of the oil states can give us a chance to get some of our own back. Suppose we said we’d fill up those reserves with true-blue American oil. Could they resist the temptation? We would lose the chance to do something useful in foreign policy. Still, we wouldn’t be doing something harmful to our national defense. And the existence of that ready reserve just might make the oil senators a little more respectful of the rest of us in the future.